All development in Carleton Place is directed by two documents; the Official Plan and the Development Permit By-law. The Town recommends that you discuss any development or construction with the planning department before commencing work. PLEASE NOTE: DUE TO WORK VOLUME VISITS WITH THE PLANNER ARE BY APPOINTMENT ONLY. PLEASE CALL THE PLANNING ASSISTANT AT 613-257-6213 TO SCHEDULE AN APPOINTMENT. The County of Lanark has the authority to approve consents (severances), plans of subdivision and condominium, condominium exemptions, part-lot control by-laws, local Official Plan Amendments and local Official Plan 5-Year Reviews. The Official Plan is the Town's land use planning and policy document. Its general purpose is to establish land use designations and policies for the physical development and redevelopment of the Town. Official Plan policies are adopted by Council to define basic goals, objectives and directions for the coordinated growth and development of the Town. It provides a framework for municipal regulations including the Development Permit By-law and the subdivision of land. The Town of Carleton Place uses a Development Permit By-law in place of a Zoning By-law, Site Plan By-law and Minor Variance. All development that takes place in the Town is required to conform to the Town’s Development Permit By-law. This document controls the use of land in the community by defining how land may be used, where buildings and structures can be located, what types of buildings and structures are permitted and how they can be used. In addition, the Development Permit By-law regulates such things as lot sizes and dimensions, parking requirements, building heights and setbacks from the street. The Town is divided into different land use designations, representing residential, commercial, industrial and other land uses. The Development Permit By-law also includes design criteria that is geared towards protecting and enhancing the existing beauty of our town. No building permit will be issued for construction that is not in conformity with the Town’s Development Permit By-law. You are invited to submit your comments regarding proposed developments, when available. Your comments will be reviewed by the Planning Department and the applicant. Comments are due 15 days after the development proposal has been posted. Carleton Place at 175 Bridge Street. Comments can be provided at this link. PLEASE NOTE: Comments made by letter, email or through the website commenting page, including commentors name and address, will be shared with Town staff, the developer, the applicant, the property owner and are part of public record. DP2-03-2019 - An application for a Class II Development Permit has been received for lands locally known as 55 Lansdowne Avenue. The property is designated Mississippi Transitional District in the Development Permit By-law. The purpose of the application is to allow the installation of a 35 meter tall monopole telecommunications tower as an accessory use to the existing use. The tower will include an 8m X 7m fenced compound. The site will provide telecommunications services in the surrounding area. Comments can be made at this link and must be received by April 20, 2019. DP3-03-2019 - An application for a Class III Development Permit has been received for lands locally known as 19 Roe Street. The property is designated Business Campus in the Development Permit By-law. The applicant proposes to construct a one storey office building. No variances are requested. Comments can be made at this link and must be received by April 23, 2019 for the second commenting period. DP3-02-2019 - An application for a Class III Development Permit has been received for lands locally known as 6 Costello Drive. The property is designated Health Campus in the Development Permit By-law. The applicant proposes to construct a dental office. No variances are requested. Comments can be made at this link and must be received by April 25, 2019 for the second commenting period. DP3-01-2019 - An application for a Class III Development Permit has been received for lands locally known as 127 Boyd Street. The property is designated as Residential in both the Official Plan and the Development Permit By-law. The applicant proposes to construct a four (4) storey, thirty-two (32) unit, rental apartment building with vehicular access via Woodward Street. A variance is requested to allow a reduction from the required 20% landscaped open space in the rear yard and incorporate a total of 30% landscape open space throughout the property instead. Consideration of a functional front yard on Boyd Street instead of a dedicated front yard on Woodward is also requested. Comments can be made at this link and must be received by April 18, 2019 for the second commenting period. DP3-01-2018 - An application for a Class III Development Permit has been received for 50 Allan Street (former curling rink property). The property is designated Mississippi Residential Sector. The applicant is proposing to construct a four storey, 33 unit condominium building which will be comprised of one to three bedroom residential units. A total of 50 parking spaces are proposed through surface and underground parking. Three units are to be handicap accessible. Please see the links below for further details. THIS APPLICATION WAS DENIED BY THE PLANNING AND PROTECTION COMMITTEE ON SEPTEMBER 4, 2018. THIS APPLICATION IS PART OF AN APPEAL PROCESS. DP2-05-2017 - An application for a Class II Development Permit has been received for the vacant lot at the corner of Townline Road East and Carleton Street, locally known as 175 Townline Road East. The property is designated Residential District in the Development Permit By-law and the Official Plan. The applicant is proposing to construct a three storey residential building to include nine residential stacked townhouse units. The developer is requesting a variance to recognize the existing frontage of 30.48m as well as a variance to the required usable landscaped open space in the rear yard from 20% to 6.8%. Please see the links below for further information. THE COMMENTING PERIOD HAS ENDED FOR THIS APPLICATION. A pre-consultation with the Planning Department is required prior to submitting an application. An Official Plan Amendment is an application process whereby policies or land use designations within the Town's Official Plan can be changed. A Development Permit Amendment is an application process whereby policies or land use designations within the Town's Development Permit By-Law can be changed. All development in Carleton Place requires approval. To get a development permit agreement an application must be submitted. Four streams of approval have been developed, with specific classes used for different types of development. The Planning Department will determine what class the permit falls under at the pre-consultation meeting. The following applications can be downloaded and filed electronically or paper copies are available at the Town Hall. Please submit completed applications to the Planning Department for review. Please refer to the contact list at the top of this page. A subdivision or condominium is a process through which a parcel or parcels of land are divided into lots or blocks. The County of Lanark is the approval authority for subdivision plans. To access the application please click the link to the Lanark County page. Part Lot Control is a means of severing land within a registered subdivision. The approval authority for removing part lot control is Lanark County. To access the application please click the link to the Lanark County page. 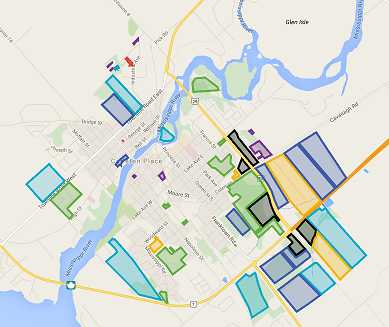 There are fees associated with all development in Carleton Place. Please see the Fee Schedule link below for Development Permit Agreement fees. Fees associated to building development and sewer and water can be found on the Development Services-Building page.